Birds range from huge bald eagles, small swallows, long-legged waterbirds and egrets to jewel-bright hummingbirds. The variety of shapes, sizes, colors and textures is so wonderful that like flowers and butterflies, they can let you use all the brights in your set without deviating from nature. Every feathered creature shares some anatomical similarities. To start working with them, do quick sketches from good photo references. They're fast-moving, so capturing one on the wing takes careful observation with sharp memory. The pose you want is probably one that was gone long before you reached for a pencil. Books on drawing and painting birds are a great help. My sketch above was done from a Walter Foster book I reviewed on this site, but I could find good step by step projects with them in books on watercolor, oils or acrylics too. Any lesson on drawing them will help -- and with oil pastels, you can copy the exercise fast without slowing down for too much detail in practice. 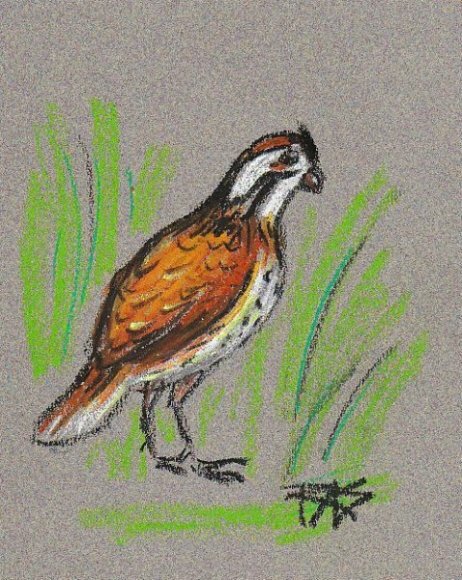 This quail demonstrates the important elements of avian anatomy. The body is a rounded oval, it may be fat and egg-like or streamlined and long, but it's an oval and probably carried at a slant. Legs are toward the end, not centrally located. Pay attention to the legs and where they bend! Their knees bend backward! Get this wrong and your art will look like a joke, something will seem horribly wrong with it. The lower leg is usually very skinny, the upper leg is a rounded triangle fat at the top and somewhat curving. Down at the foot, long toes splay out usually with claws at the tips, while the "heel" may come up and form another joint. Birds walk on their toes. There are usually three toes and perhaps a backward toe. Some birds have four toes, two forward and two back. Look closely at examples for the species you're painting, or at least examples of its general type. Long or short bird legs all have the same structure, but waders can have very elongated legs. In flight, legs are sometimes hidden by the belly feathers as the creature pulls them up tight to become more streamlined. Tail shapes vary but will fan out from the bottom tip of the oval. Heads are rounded, with short or long necks. If a bird has a long neck, it will often fold into a graceful S-curve. Faces have expression by broad gestures rather than the mobile features of a mammal. Beaks are either open or closed and have a hard fixed shape. Eyes are large and shining, often seem to be completely black, but add a little catchlight white speck to help establish that they're shiny and what direction they're pointed. Wings have a particular structure, folded or spread. The joints unfold in specific ways, the flight feathers fan out from them in the same order whether it's a tiny hummingbird or a great eagle, and their motion can make them blurred in flight. Below is a sketch on watercolor paper primed with clear Colourfix primer and an iridescent coppery watercolor of a barn swallow in flight. The wing structure is complete on my sketch of the upper outstretched wing. The long flight feathers are flight pinions. The layers of smaller feathers, often in contrasting colors or patterns, are coverts, there are two or three rows of them and some may be large enough to see individually. 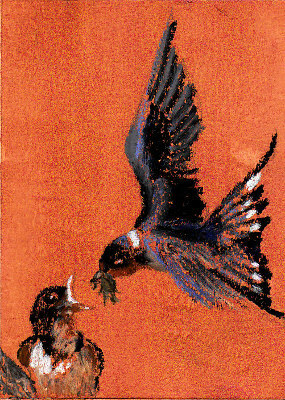 I drew this sketch from a good photo reference posted at WetCanvas.com for the July 3-5 2009 "Weekend Drawing Event," hosted by WC member JustChaos, who provided my reference for this barn swallow for members to use in the challenge. WetCanvas is free to join and has an enormous Reference Image Library for members' use including a huge section with hundreds of great references from eagles to ducks and hummingbirds. I strongly recommend joining WetCanvas if you're not that great a photographer, or if you'd like to become a better artist and photographer. The community is very supportive, you can receive critique from professional artists and brilliant amateurs and the atmosphere is very supportive. To draw and paint birds well, good references are important. Compare many different photos and sketches by different artists. A book by Charles R. Knight, Animal Drawing, Anatomy and Action for Artists has proved to be incredibly valuable for me in studying avian and animal anatomy. Skeletal anatomy drawings in meticulous accuracy by this famous nature painter are combined with drawings of musculature, eye and feather structure. I'll be reviewing it in depth for this site, because it's valuable for all types of creatures -- mammals, birds, reptiles. Watch for the updates, or for the title to have turned into a link. Other good references on bird anatomy and drawing are easily available, but the Charles R. Knight book is wonderful for its depth and comprehensive accuracy. It's also an inexpensive Dover book that's always in print, so this classic belongs on the shelf of anyone who's serious about painting birds or animals of any kind. I've worn out three copies. I chose this Barn Swallow reference because JustChaos successfully captured a bird on the wing. 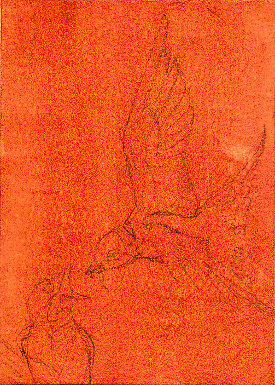 The near wing or lower wing is almost horizontal to the viewer, it's also blurred. In this area I'll use loose, sketchy strokes to show the wing and shade them a little to show the body curve through the wing. The big lovely upstretched wing will be painted in more detail but I'll still keep it loose. 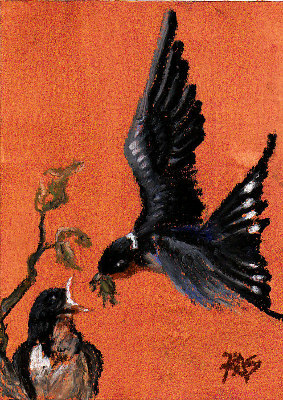 The focal point of this painting is the meeting of beaks between the barn swallow and its young. I placed that focal point close to the lower left focus point by the Rule of Thirds and will put the most details on the birds' faces. Since I created a specialty background with clear Colourfix primer and Daniel Smith's luminescent Autumn Mystery watercolor, I'm not doing anything to the background unless when the bird is done, a few loose strokes for twigs are needed. I'd rather show the interesting textures and variations created in the wash and keep the viewer's attention on the birds. If you want to create your own Barn Swallow painting, either choose a good warm colored background in Colourfix sanded pastel paper such as Raw Sienna or Terra Cotta, or paint a loose watercolor wash background on heavy 140lb cold press watercolor paper. Yours could also be variegated greens with streaks of brown twigs through them or a misty cool gray, violet or blue. Just keep the background value in the medium to light range because the birds are very dramatic with strong light and dark elements. If you want to do it as a quick sketch, any medium-value tinted paper like Canson Mi-Tientes should work fine. Use the smooth side on Canson, some of the details are small. Copy my sketch several times till you get it right, or print it out and trace it or scale it up using grid method. I'd provide a clean line drawing tracing, but my tracing paper is still buried down in the garage in boxes to be unpacked. So this is an opportunity for you in observation and sketching. -Draw from my sketch or the finished painting, keep sketching till you get the proportions right. Notice that the bird's longest tail feather at the bottom sweeps out of the picture, while the upper long tail feather doesn't "kiss" the edge. If you need to adjust the shape of your picture to keep from "kissing" then do it. I also made sure to draw it to a size where the top of the outstretched wing wouldn't kiss the top of the picture. Let's go to the next stage of Barn Swallow, blocking in color. Using black, white, a deep violet, a medium-dark gray, a greenish gray, a reddish brown and a tan, I've roughed in the colors of the Barn Swallow painting. I'm not happy with the bit of branch the baby bird is sitting on, so I will need to add another twig or two into the background to liven that up -- mostly to have something come off it and lead back into the painting. I used Sennelier oil pastels because I've been meaning to do a serious painting entirely in Senneliers. The broken color looks nice on this and some areas look almost finished, but I can refine them farther with better shading. Go lightly at first. Don't press hard. Broken color in your first layers leaves the option of adding more or not. If an area comes out looking just right, leave it. One advantage I've found that happens from writing these demonstrations is that when I scan my work at the blocking-in stage, the thumbnail in my computer gives me a quick look at the painting from a distance. That shows me if the composition's balanced and the values and colors work. If the little thumbnail that's lost all its details looks great, then I know I've got a good painting in progress. If instead, I see a major problem in the thumbnail, I can correct it in my next pass on the painting -- like adding the twig I wasn't sure if I'd need. Painterly strokes, flowing passages of blended color and broken color are all ways to make your bird paintings more lively. I refined my blocked-in version of Barn Swallow lightly, working from the reference but also studying the thumbnail on screen. Not every detail needs to be explicit. The eye of the barn swallow wasn't very clear at all, so I strengthened it. The shading on each feather was much more precise in the photo, but I chose instead to give an impression of it with long strokes that followed the shape of the feather loosely. Broken color and softened edges in blended areas are both ways to keep from misplacing emphasis. They often give a light, fluffy look to feathered areas. As with fur, go in the direction of the feathers. Look at where the light falls on the mass of feathers to capture three dimensional roundness on the bird. Place added highlights on shiny elements like the bird's beak, eye and possibly claws if it's a raptor. Where wings catch the light, a soft dull highlight will emerge. This can gain emphasis by using short directional strokes that suggest the smaller feathers of the coverts and the leading edge of the wing. If your underlying sketch is accurate, looseness in the painting only makes it a more beautiful painting. Save your strongest contrasts for the focal point of the painting. Choose colors that have a good harmony. A flat background can work very well for birds, it keeps attention on the creatures rather than their environment. Some birds are so camouflaged that unless you give them a flat white or black or contrasting background, you can't even see them in the painting. This can work to your advantage if the point of your painting is the camouflage, making the viewer work to find the bird of the title and then discover it's rendered in great accuracy is another type of elegant painting. For that, I would have worked much larger though and created a landscape setting as powerful as the central subjects. The color balance of this painting is blue and orange. Many variations on blue, blue grays, violets, green-blue grays all go into the dark areas of the birds and get reflected in the branches. I deliberately kept the contrast on the leaves and twigs more muted so that the birds would keep center stage. Try this with my demonstration, adapt it to your own tastes. Or work from a clear large bird photo from WetCanvas or your own collection. Block in color loosely, then work heavier into areas where the feathers are thick and add final details. If your sketch is accurate, your painting will be true and powerful whether you go for detailed realism or bright impressionism.